Peanuts are not only among North Carolina’s top agricultural commodities, they also represent a key source of protein for people around the world. Making them even better has been Tom Stalker’s life work. A professor and former head of NC State’s Department of Crop and Soil Sciences, Stalker is considered one of the world’s most important peanut scientists. He’s especially known for efforts to maintain, characterize and use genetic material from wild peanuts to diversify and improve cultivated species. Stalker has traveled around the globe to collect and distribute seeds and plant tissue, to share his knowledge with farmers and fellow researchers and to serve as a leader in the effort that resulted in the first peanut genome map. 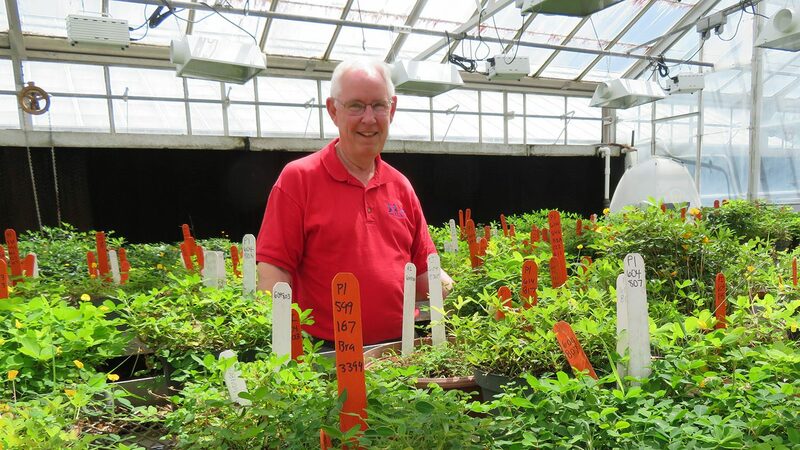 Offspring of the 18 peanut breeding lines he has developed over his nearly 40-year career at NC State have been used by other scientists to create countless peanut varieties. These breeding lines are especially known for resisting pests, and their descendants are used throughout the world — in North and South America, Asia, Africa and Australia. The medal goes to an individual who’s shown dedication and service to humanity through collecting, evaluating or conserving the Earth’s genetic resources. Bailey, a popular North Carolina variety developed by Stalker’s colleague Thomas Isleib, traces its disease resistance to Stalker’s breeding lines. And more and better genetic materials are on their way, Stalker said. Stalker’s dedication and service have not been limited to peanut science. Earlier this year, he was inducted into North Carolina’s prestigious Order of the Long Leaf Pine, an award from the governor recognizing outstanding service to the state. He also received the national Distinguished Eagle Scout Award. The latter honors those Eagle Scouts who have, over the 25 years or more since they received that recognition, reached the highest national level of success in their field and demonstrated a strong record of volunteer leadership in their communities. Stalker became an Eagle Scout at the age of 13, and his two sons are Eagle Scouts. He has been a volunteer Scout leader for the past 37 years.